This nostalgic table topper would be perfect for country decor. Rustic plaid appliques on a tan-stripe background emulate the penny rugs first made popular in the 1900s. 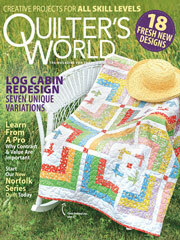 This e-pattern was originally published in the June 2004 issue of Quilter's World magazine.